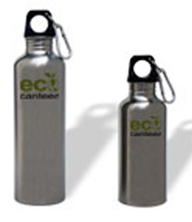 Eco Canteen is a stainless steel water bottle from a non-profit company by the same name. They describe their efforts as a “labor of love,” doing all they can to get people off of bottled water. I received a bottle at no charge for review purposes. I tried the adult size, which is 26 ounces and made of food-grade stainless steel. An insulated tote is also available, but I didn’t try it. One nice thing about the Eco Canteen is the large opening at the mouth. It makes cleaning easier than with the SIGG bottle and it’s lighter to carry. The lid is easy to remove and re-secure. I didn’t notice any leaks. Of course, it’s also completely BPA free. Overall, I think this is a good basic water bottle for a fair price ($9.99). Though not as decorative as the SIGG, it still gets the job done. If you’re looking for good office gifts in the $10 range, I’d suggest these. The only thing I don’t like is that a video starts playing when you visit the Eco Canteen site. Sure, you can turn it off, but it’s just a pet peeve of mine. Still not convinced you should ditch bottled water? Keep in mind that a 20 oz bottle of water takes 5 oz of oil to produce and ship, plus you’re left with a plastic bottle that’s not so reusable. Another great post. I like your little paragraph at the end about the amount of oil it takes to produce and ship plastic bottle and whatnot. Interesting info. And imagine, Americans use and waste 2.5 million plastic bottles daily. That’s a lot of oil. Thanks for the blog, keep posting!